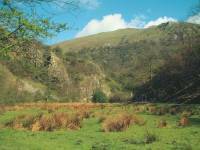 Today's walk of 9½ miles is based on Dovedale. Dovedale is special. Not quite premier league stuff as scenery goes, perhaps, but certainly a major highlight, and one that attracts visitors from far and wide. Dovedale is a limestone gorge, lightly but pleasantly wooded, the river gurgling pleasantly along its bed (unlike so many limestone gorges, in which the river has long since disappeared into the bedrock). 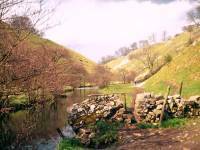 "Scenic" Dovedale is entered between the portals of Bunster Hill and Thorpe Cloud, and runs northward, twisting and turning among the limestone outcrops, to the National Trust village of Milldale. The path through most of this section is paved and graded for the infirm. Beyond Milldale we enter upper Dovedale, which is off the "tourist" route and, while still immensely pretty, is less spectacular. At Wolfscote Hill it divides into Beresford and Wolfscote dales, and we follow the latter (left) fork. The dale eventually peters out and we walk through pastures northwards to the village of Hartington. 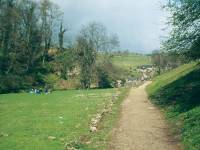 The walk starts from Ilam, mainly as it's the nearest village to the southern end of Dovedale and also has a youth hostel. Most public transport links, however, bypass Ilam and call instead at Thorpe. Hartington lies on a well plied bus route between Ashbourne and Buxton, and also has a youth hostel. 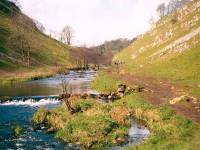 Update, December 2004: The route immediately to the south is being revised, and a knock-on effect is that this walk will begin at Thorpe rather than Ilam. The narrative will be updated at a laer date. Photographic note: These images were taken at Easter, 1990, and are a bit ropey. I intend to replace them with a better set at some future date. Ilam has an unfortunate spelling, one that's all too ambiguous when set in type. 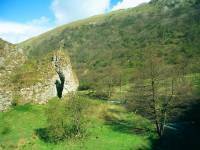 It's revealed in full capitals as "ILAM", but how many people have looked for "IIAM" or "LIAM" in guidebooks or asked directions to the apparently Welsh village of "LLAM"? Confused identity aside, Ilam is a thoroughly pleasant little place, enlivened by the presence of the river Manifold that loops around the village. Ilam Hall is nearby, a minor stately home surrounded by a country park and accommodating the youth hostel. 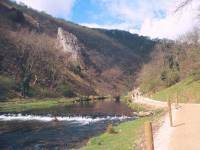 The southern jaws of Dovedale are about 1km to the east and the obvious route is by road, but keen eyed map readers will spot the local footpath that veers away from the road, crossing the lower slopes of Bunster Hill behind the Izaak Walton hotel. 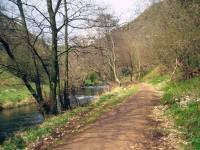 The path comes out beside the main Dovedale car park. Thread your way between the vehicles and join the throngs of tourists along the path into the gorge. The River Dove forms the county boundary between Staffordshire and Derbyshire, and you're currently on the Staffordshire side. This initial leg of Dovedale heads northeast for about 600m and, annoyingly, it lays across the boundary between the front and back halves of the Ordnance Survey's 1:25000 White Peak map. Assuming that you're able to unfold and refold this massive sheet of paper without it taking to the air in the wind, you reach the bend and find the first interesting feature of the day - the stepping stones across the Dove into Derbyshire. Take your time, give a helping hand to the unsure, and don't be hurried or put off by the smartasses (and above all, avoid anybody accompanied by a dog on a lead. One friendly pooch dashed off into the stream, charged in front of me, wrapped its lead around my legs and nearly pitched me into the river. The owner didn't have the nous to let go of the lead and I had words with him). It was a suggestion of Wainwright in his "Pennine Way Handbook" that led me to conceive this route. Wainwright had an opinion about the Pennine Way. "A true Pennine Way", he wrote, " would lie along the full length of the Pennine Range and would have better suited the name had it been confined within these extremities, taking in the lovely Derbyshire dales... better that the Pennine Way had been given the glorious entry to the hills provided by charming Dovedale as its starting point." Wainwright was often given to bouts of pithiness and forthright opinions in his guides, and now I'm going to follow suit. 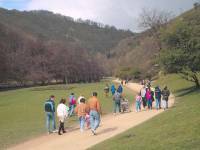 Dovedale is in the care of the National Trust, who have vastly improved the parking and visitor facilities and the quality of the path through the dale. Fine in concept, as it has realized the laudable aim of opening up the dale to those (such as the wheelchair bound) who would otherwise have no opportunity to enjoy scenic gems such as this. 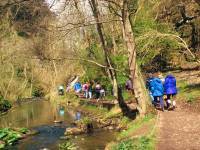 But in practice, Dovedale now tends to attract those who are ill-equipped for country walking and (more worryingly), those who shouldn't be allowed out on their own in the first place. 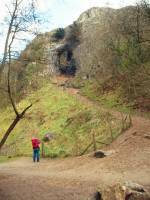 In short, the hooligans have discovered Dovedale. We walkers like our countryside unsullied by noise and bustle - that is, after all, the whole point of being there. You can understand that hordes of kids will make a lot of noise, even though you might wish they wouldn't. But the radios and ghetto blasters and the general air of lager-fuelled loutish behaviour is unforgivable. Apart from the idiot with the dog mentioned in the paragraph above, I'd witnessed another family not five minutes before who were shrieking with laughter as they forced their pet dog to teeter across a cattle grid. The whole point about cattle grids is that they're designed as potential leg breakers to prevent animals attempting to cross them- anybody with half a brain cell who actually had feelings for their doggie would have carried it or used the bypass gate. Louts. 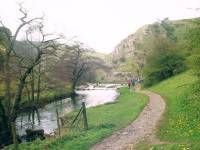 My advice is not to go to Dovedale on a bank holiday or a summer Sunday, and to get there as early as possible when you do go. It deserves to be enjoyed in peace. "Tourist" Dovedale runs for almost three and a half miles, looping around the dale's twists and turns and passing beneath rock formations with names that sometimes border on the fanciful. There's always a "Jacob's Ladder" on any steep slope near a tourist spot (there are Jacob's Ladders at Cheddar and at Edale, and probably countless others). There's also the Twelve Apostles, and there's a Lovers' Leap, but at least Tissington Spires and Pickering Tor are more in keeping with areas of high scenic value. 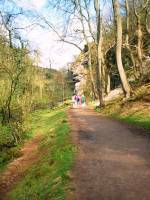 There are several rock arches and natural caves on the Derbyshire side, which invite exploration. 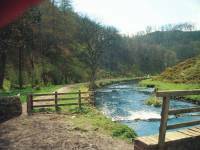 A dogleg beneath Ravens Tor, about two miles up the dale, features an extensive area of turf within the river's meander at its foot, which is naturally put to use as a picnic site. But no camping here, please. As you progress up the dale the crowds do start to melt away - most day trippers feel nervous if they venture more than two hundred yards from their cars and it's a miracle that so many of them make it as far as they do. Maybe it's a good thing - perhaps those who set out on what they likely see as a bit of an adventure will become proper country lovers in time. Okay, I've vented my spleen enough. Back to the narrative. 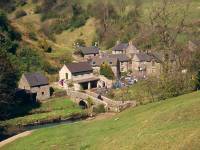 At the end of "Tourist" Dovedale you reach the National Trust-owned village of Milldale. Milldale is charming, timeless and chocolate-box pretty. That's the upside of its National Trust ownership. The downside is that it has no facilities. Thank heavens that as a consequence it's not full of amusement arcades and tat shops, but one might at least have expected a coffee shop. Dovedale doglegs to the east for about half a kilometre at Milldale and the straightforward route onwards is to follow the little motor road in this direction, but a more elegant hiking route takes a footpath up to Shining Tor, the lip of the high slopes just to the south. You'll see the path marked on the OS map although finding where it commences isn't easy. 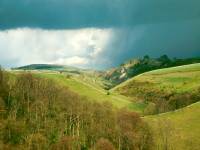 The third picture above is a view along upper Dovedale from Shining Tor, just before a nasty April snowstorm descended over the area. Follow this path eastwards until it falls to the road, then walk back along it for about 250m before turning right (north) into upper Dovedale. 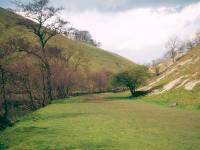 Upper Dovedale has a more open aspect than the lower dale and is more a valley than a gorge. 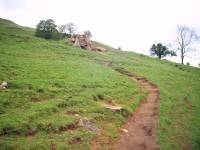 The path, although improved in places, is generally rougher and the tourist traffic is far lighter. The dale continues to meander much as before, revealing a new vista of water and lightly wooded slopes every few hundred meters. 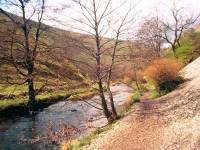 A mile and a half north of Shining Tor, Dovedale forks into two lesser dales; Beresford Dale, heading northeast, and Wolfscote Dale, heading west of north. 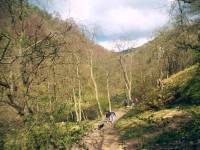 We follow Wolfscote Dale. The valley's name may have changed but the river's hasn't - it's still the Dove that gurgles beside us. Wolfscote Dale runs for a further mile and a half. This part of the dale is straighter than before but as a compensation the river becomes livelier, with an increasing number of little weirs and rapids. 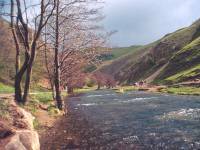 The floor of the valley is also appreciably wider, giving plenty of opportunities for refreshment halts. Eventually the valley grows wider and shallower, effectively petering out. The river curves away to the left (west), leaving the route to run through a succession of pleasant grassy meadows for the last half mile into Hartington. The pleasant little knoll of Pennilow rises immediately to the right of the path, but unfortunately there is no right of way to the top. The path runs quite suddenly, almost without warning, into Hartington, squeezing between a couple of buildings to emerge onto a lane just a couple of hundred meters south of the village square. 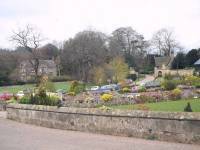 Hartington is a thoroughly pleasant place, bigger than Ilam, and thriving to an extent on tourism. If you're dying for that ice cream or pot of tea, you'll have no trouble finding it here. The 442 bus will whisk you onwards to Buxton or back to Ashbourne, from where a variety of connections are available back to the principal towns and cities of the Midlands and the conurbations of South and West Yorkshire and Greater Manchester.